This is a quick preview of the up-coming Playoff Series for the Texas Stars before they take on the Chicago Wolves. ﻿ Stars Leading Regular Season Scorer: Aaron Gagnon, 58 points (27 goals, 31 assists). Wolves Leading Regular Season Scorer: Jason Krog, 72 points (14 goals, 61 assists). Stars Leading Regular Season Goalie: Matt Clime, 2.46 Goals Against (21 wins, 17 losses). Wolves Leading Regular Season Goalie: Peter Mannino, 2.34 Goals Against (26 wins, 5 losses). Something worthwhile about the Stars: The Texas Stars have the highest average playoff attendance of the final four teams in the Western Conference. Something useful about the Stars connected to the AHL Playoffs: Stars goalie, Brent Krahn, leads all AHL Goalies in the Playoffs with a 1.25 Goals Against Average and a 4-0 record. Something useful about the Wolves connected to the AHL Playoffs: The Wolves have won the Calder Cup twice before (01-02 and 07-08.) In the 2007-08, their last Calder Cup, they were the number 1 seed. Who needs to be the difference for the Stars: Jamie Benn: the rookie “call down” so to say had a slow start to these playoffs. Benn was expected to start the season on the Texas Stars, but a strong camp lead him up north to the Dallas Stars. Benn had his break out game of these playoffs in game three with two goals and two assists. Benn has to lead this team in goals if the Stars look to advance to the Western Conference Finals. Who needs to be the difference for the Wolves: Jason Krog: The Wolves leading scorer this season had a slow first round. With only scoring two goals and two assists his team struggled against the Milwaukee Admirals. Krog needs to be the playmaker on the ice like he was during the regular season; if the Wolves look to advance to the Western Conference Finals. Prediction: The Stars need to find a way to steal either game one or two while in Chicago. 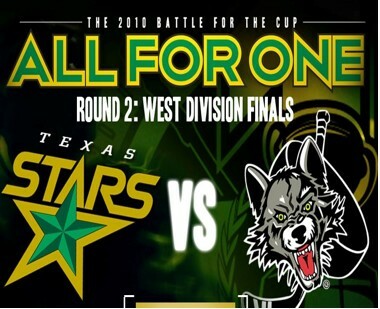 This will give the Stars the “home ice” advantage over the Wolves with game three, four, and five at the Cedar Park Event Center. Krahn played phenomenally against Rockford, and he will have to continue his stealer play in this series.